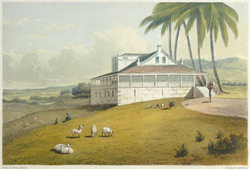 Print of Bryan Castle, taken from James Hakewill's 'A Picturesque Tour in the Island of Jamaica.' Bryan Castle was built by Bryan Edwards, a British politician, but by the time this painting was completed in the early 1800s it had become the residence of Alexander Donaldson. The great house was situated on a hill and held a commanding position on the 1402-acre estate. It was encircled by an open walkway which would have provided shade throughout the day.